Sanchez-Mut JV, Huertas D. and Esteller M.
Down syndrome (DS) is the most common example of neurogenetic aneuploid disorder leading to mental retardation. In most cases, DS results from an extra copy of chromosome 21 (HSA21) producing deregulated gene expression in brain that gives raise to subnormal intellectual functioning. 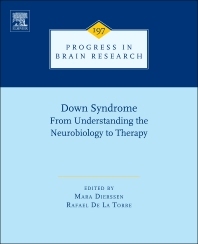 The topic of this volume is of broad interest for the neuroscience community, because it tackles the concept of neurogenomics, that is, how the genome as a whole contributes to a neurodevelopmental cognitive disorders, such as DS, and thus to the development, structure and function of the nervous system. This volume of Progress in Brain Research discusses comparative genomics, gene expression atlases of the brain, network genetics, engineered mouse models and applications to human and mouse behavioral and cognitive phenotypes. It brings together scientists of diverse backgrounds, by facilitating the integration of research directed at different levels of biological organization, and by highlighting translational research and the application of the existing scientific knowledge to develop improved DS treatments and cures. Mara Dierssen is a Doctor in Medicine and Surgery from the University of Cantabria, (1989). She leads the Cellular and Systems Neurobiology laboratory at the Genomic Regulation Center (CRG) and is associate researcher of the Hospital del Mar Research Institute, where she promoted the creation of a translational research program to study new therapeutic approaches in intellectual disability. Her main current scientific interests are focused on the study of the neurobiological mechanisms underlying memory and learning and their alteration in complex diseases (polygenic and multifactorial) and in the development and application of this knowledge to the field of clinical practice. Among her scientific contributions in the field of neurobiology and neuropharmacology is the identification of the alterations of neuroplasticity in various intellectual deficiencies and psychiatric pathology, and the determination of their molecular mechanisms. She is internationally recognized in the study of Down syndrome, whose findings, especially the involvement of the DYRK1A gene in the neuronal pathology of this syndrome, have had a direct impact on the identification of new pharmacological targets. Dr. Dierssen has demonstrated for the first time significant beneficial effects of a pharmacological treatment that improves neuroplasticity in the field of intellectual disability, a finding that has revolutionized the therapeutic approaches in cognitive disorders. Her scientific interest in innovating tools and strategies, incorporating brain-computer interface technologies to improve communication in patients with cerebral palsy, or cognitive stimulation videogames are also in the forefront of Neuroscience. He has published more than 160 research papers in indexed scientific journals. At present, the H index (Hirsch Factor) of Dr. Dierssen is 46. Dr. Dierssen is one of the few Spanish members of the Europaea Academy of Sciences, and has held different positions of responsibility, being president of the Spanish Society of Neurosciences, the International Behavioral and Neural Genetics Society and the Trisomy 21 Research Society. She has obtained the Ramón Trías Fargas Prizes, National Prize of Thought and Scientific Culture of the Generalitat of Catalonia, Jaime Blanco, Sisley-Lejeune Award, Hillie-Mahoney Award, Trébol Down Spain Award, Optimists Committed Award, Trifermed Social Impact of Healthcare Award, BigVang Medal among others. She has been named Distinguished Student of the University of Cantabria, and is an honorary member of the College of Physicians. She is elected member of the European Allianz for the Brain (EDAB), founding member of the Spanish Association for the Advancement of Science, member of the Scientific Council of the Pla de Ciència of Barcelona, among other positions. She has held teaching positions at the Ramón Llull University, the Autonomous University of Barcelona and the University of Cantabria, and has directed more than 20 doctoral theses and trained a large number of researchers, most of whom run their own groups in prestigious centers.